So this episode was a riot in my opinion. There were just so many moments in this episode where I think they got too meta for their own good. "So, um... do we walk back up the slide, or what?" Andrea Libman was on par this episode. Every line of dialogue from her was absolutely perfect. So did you guys like this episode or naw? Discussions below! I actually really liked this episode. Another "Pinkie Pie saves the day" episode. We were also able to view another of the many species from Equestria, the Yaks. In other words, the Equestrian version, equivalent to vikings. At least they behave like them. 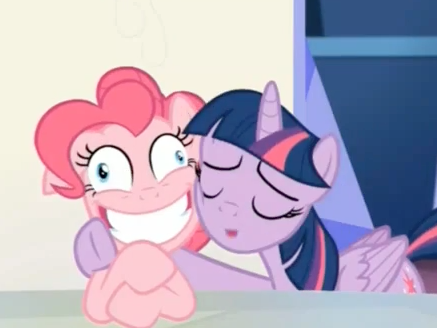 I also found Twilight and Pinkie's different faces very amusing, the best part for me. My favorite part of the episode was when Pinkie Pie was sent back to equestria. Today I learned a very valuable lesson about the world. I learned that all foreigners are savages, and that rather than trying to merge our cultures, we should instead force them to accept our own, as it is the only thing which can be done right. I also learned that if you make a foreigner angry they will destroy your property and declare war on you and your people. Actually the episode was pretty good.